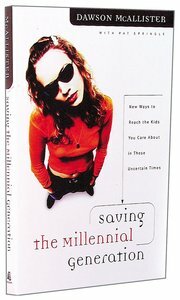 About "Saving the Millennial Generation"
Meaningful relationships, genuine connections, and real love: if those are the things this generation of teens-- the Millennial Generation--is crying out for, who can deliver? You can, says Dawson McAllister. Yes, you the parent, you the youth worker, you the teacher--anyone who wants to show teens the real love of Jesus Christ. But if you want to give Millennials what they're looking for, you've got to be willing to meet them on their own turf. And that's not always easy because the Millennial Generation is one of the most skeptical generations in history. You don't have to let them down. Saving the Millennial Generation will help you understand Millennials--what makes them tick and what ticks them off when it comes to school, church, and home. You'll have to earn their trust, but it'll be well worth the effort. Because in the end, you'll build relationships that will bring fruit both today and into all eternity-- for you and for the Millennials. For years, sociologists -- and marketing experts -- have focused on the Baby Boomers and Generation Xers. The generation after the Xers (people born since 1982), called the Millennial Generation, is in some ways a continuation of a trend. But in other ways, this generation is a breed apart. Dawson McAllister, who has worked with hundreds of thousands of young people, offers insight into how to relate to this up-and-coming generation. He talks about the forces that have shaped the Millennial Generation, its expectations of authority, how to make church "work" for the Millennial Generation, parenting and discipling strategies, what makes this generation different from other generations, and how this generation shares the spiritual needs of every generation. A fascinating and practical look at young people today -- and how we as adults can learn to relate effectively to them. For more than twenty-eight years Dawson McAllister has been speaking to and for the American teenager. Born and raised in Peoria, Illinois, he graduated from Bethel College in Minnesota and then studied at Talbot Theological Seminary. When he is not hosting his radio program or speaking at a conference, McAllister is at home with his wife and two adopted sons. They live on a farm--McAllister's an avid horseman--just south of Nashville, Tennessee.